Photos of Nicolas Cage dressed in traditional, nomadic garb in Astana, Kazakhstan attending the Eurasia Film Festival have gone viral with several memes on the Internet that drop the actor into famous historical photos, including one that has him standing with Richard Nixon and Elvis Presley at the White House. But it's no laughing matter, says a human rights group taking Cage to task for ginning up positive press coverage for an authoritarian regime. During his 26-year rule over Kazakhstan, President Nursultan Nazarbayev shut down independent news outlets and arrested critics, including journalists and a theater director, according to a report from the Human Rights Foundation. In 2011, government forces killed more than a dozen peaceful protesters during the Zhanaozen massacre, notes HRF, the group famous for smuggling copies of The Interview into North Korea to embarrass Kim Jong Un. 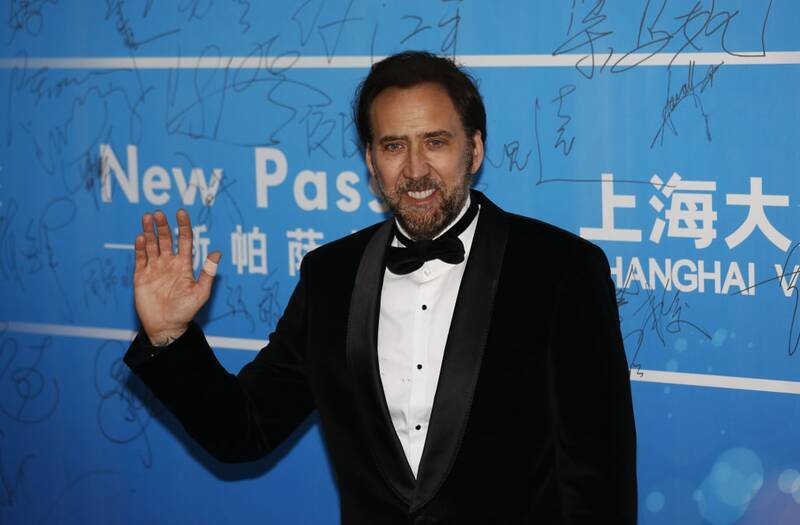 Despite the reported violations of human rights, Cage appeared at the festival as a VIP guest, leading some to believe he either endorses the leadership or allowed himself to be used as a public-relations pawn. "I would be pleased to participate in some film project on the territory of Kazakhstan," Cage told journalists while attending the festival. "I enjoyed the architecture of your capital. What I saw reminded me of an old black-and-white film that depicted the future." All of this was much too much for HRF president Thor Halvorssen, who is set to issue a press release Wednesday to journalists worldwide criticizing Cage. "His glowing review gave Kazakhstan's dictatorship much-needed PR, and his photos boosted the regime's visibility on the international stage," said Halvorssen. The photo getting the most attention features a stoic Cage in a fancy, full-length coat and furry hat standing beside festival president Aiman Mussakhajaeva, though in Internet memes she's sometimes misidentified as First Lady Sara Nazarbayeva. "Cage should be mortified that he participated in a whitewashing stunt for a murderous tyrant," Halvorssen said. HRF is a nonpartisan, nonprofit organization that promotes human rights globally. It got itself on Hollywood's radar when it floated copies of The Interview into North Korea via balloons after that country hacked into the computers of Sony Pictures in an attempt to prevent the release of the comedy since it is critical of the Kim regime. "Cage and his publicity team could have determined from a quick online search that Kazakhstan is ruled by a brutal dictator," said HRF chief strategy officer Alex Gladstein. "Celebrities could be playing a key role in the struggle for human rights, especially in places like Kazakhstan where artistic freedom is most under threat," Gladstein said. "To see role models like Nicolas Cage instead take the side of dictators is profoundly disappointing and a sign that human rights aren't a consideration for Hollywood stars." THR reached out to Cage's reps for comment but had yet to hear back when this article was published.